What is a turbine blade? 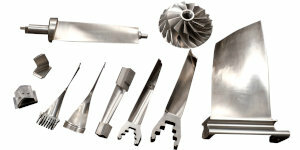 Since 1979, we have been producing turbine blades for steam turbines of thermal and nuclear power generation, gas turbines, marine superchargers, auxiliary pumps and axial blowers for steel plants. We are proud that our machining technologies accumulated over the years, coupled with excellent production facilities, acquired a high reputation as a subcontractor from major corporations such as Toshiba Corporation, Mitsubishi Hitachi Power Systems. Ltd., Mitsubishi Heavy Industries Compressor Corporation, IHI Compressor and Machinery Co., Ltd., Shinko Ind. Ltd. and Mitsui Engineering & Shipbuilding Co., Ltd. Since 1988, we have been responsible for machining jet engine parts for the IHI Compressor and Machinery Co., Ltd. and IHI Soma Aero-Engine Works. Furthermore, we have been receiving orders of jet engine parts machining from Nagoya Guidance & Propulsion Systems Works at Mitsubishi Heavy Industries, Ltd. since 1995, and from Kawasaki Heavy Industries, Ltd. since 2012. We meet customers' requests by providing such machining by reinforcing production equipment, such as a large-scale NC turning machine, a large-scale NC lathe and a 5-axis machining center. For over forty years, we have been responsible for machining major equipment as a subcontractor of KITZ Corporation. 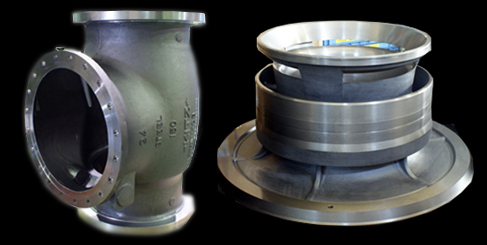 The products include large and medium-sized cast steel valves and steel valve bonnets. We also process major parts for IHI Compressor and Machinery Co., Ltd., such as casings of large-scale superchargers for marine diesel engines. We meet customers' requests by providing such machining by reinforcing production equipment, such as a large-scale NC turning machine.